Back in May - here we are again, dancing in Abingdon market place for International Dance Day which was organised by Abingdon Town Council, which another wonderful sunny day. We had debated all week about doing our veil dance, but it's always a bit risky when dancing outdoors. Good job we decided against it - it was quite windy. This day we were dancing for Abingdon Dance Studios, along with the Street Dancers and Cheerleaders. Also dancing was a fabulous group of Irish dancers, Ceroc dancers and Abingdon Morris dancers. There are 5 of us dancing here - Rita is tucked away behind Jen. Had the usual odd mishap during our dancing - forgetting which track came on next so being in the wrong position - ooops. Maybe nobody noticed Jen running to get into place eh? Lovely Jen was also face painting at this event too (no end to her talents), and forgot to bring her dance shoes - mmmm - nice belly dance costume with brown cowboy boots Jen!! 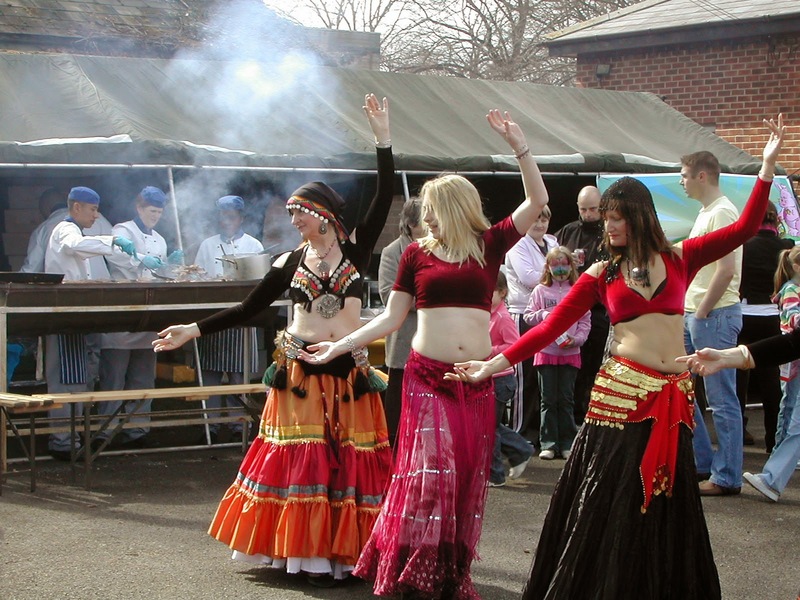 All week the rain lashed down - and we were booked to dance at Dalton Barracks on the Saturday (along with the Abingdon Morris dancers), an annual spring event with BBQ. As if by magic the day dawned with lashings of sunshine which continued all day. We did find it extra warm though when we danced a little too near the huge BBQ next to us and a bit tearful when the smoke blew over us - all good fun though. 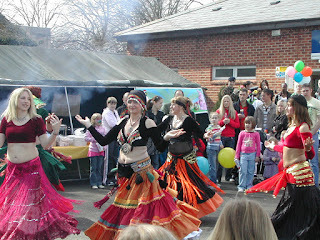 Dalton Barracks laid on superb food that day, and it was lovely to see many families there.